Tomatoes sometimes seem as if they are dying from the bottom of the plant to the top. When the lower leaves of tomatoes begin to turn yellow, then brown, it’s a good practice to keep them clipped off so the plant puts its energy into producing healthy leaves, flowers and fruit. 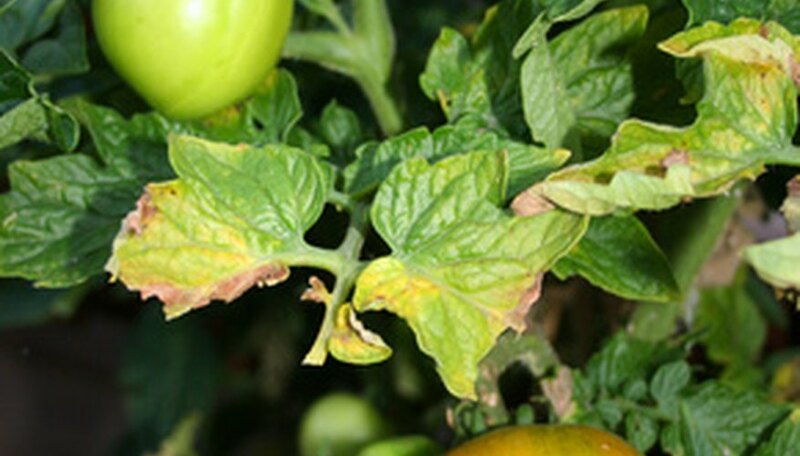 The causes of yellowing tomato leaves at the bottom of the plant can be viral diseases, such as tomato yellow leaf curl, fusarium wilt or early blight, as well as insects, such as whiteflies and aphids. Whatever the cause, you can help your plant by cutting off yellow leaves. Cut lower leaves that are turning yellow when your tomato plant is dry--this will help to avoid introducing diseases. There is no need to cut off healthy green foliage unless you want to remove suckers from the base of leaves to keep your plant compact. Pour about ½ cup of a bleach solution (one part bleach, nine parts water), hydrogen peroxide or isopropyl alcohol into a bowl. Then moisten a clean rag with the liquid--you will be using this to clean your clippers as you cut the leaves. Snip each leaf off where it connects to the main branch using your garden clippers, being careful not to cut into the branch. To prevent the spread of any possible diseases, wipe your clippers every few cuts with the rag you moistened in bleach, hydrogen peroxide or isopropyl alcohol. Dispose of clipped leaves in a garbage bag instead of adding them to your compost pile because yellow leaves on your tomato can indicate a viral or fungal problem, which might spread to other plants if you keep the leaves on your property. Wash your gloves after you are finished cutting tomato leaves and be sure to cleanse your clippers one final time with bleach, hydrogen peroxide or isopropyl alcohol. To avoid viral and fungal diseases of tomatoes, purchase disease resistant varieties. The website Growing-tomato.com offers this advice: "There are no specific, definite guidelines with regards to pruning tomatoes. Some people live by it, most prune a little, and some don't prune at tall. What matters is your own personal taste." Avoid cutting off a large number of leaves each time you prune your tomato. This practice can deprive the plant of protection it needs from sunburn. If your plant is badly infected with a disease, no amount of pruning will save it.